In celebration of Women's History Month we take pause to underline the work of two of our female artists, Tatiana Parcero and Jennifer Greenburg. Both have enjoyed recent sales, curatorial, and editorial attention. These featured works overtly address womanhood, and expound on the experiences of women in western culture through time. Parcero's Nuevo Mundo #17 reminds us of the one thing we all have in common: we were all born from women. 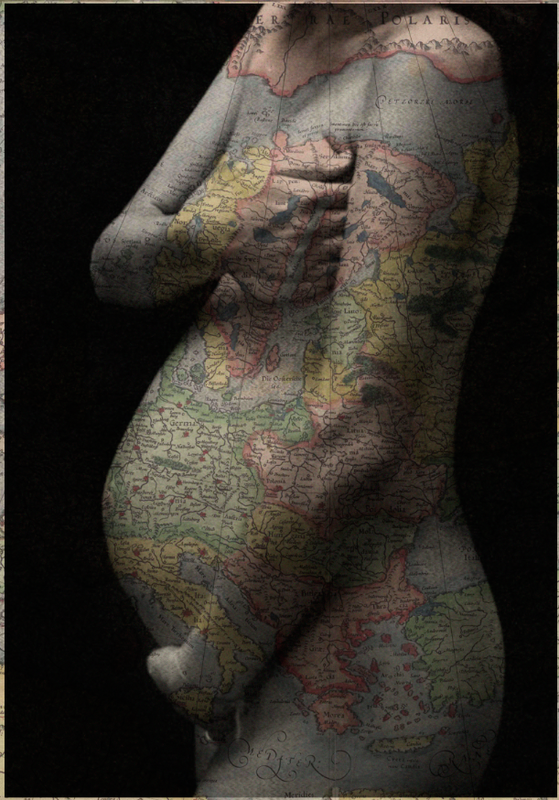 It is a fruitful image, the pregnant belly of the figure speaks to new dawns; the integrated mapping speaks to new horizons. The work is full of promise, but also speaks to control via mapping. If knowing something is owning it, then mapping something is controlling its every inch. The fact that this is a colonial map only serves to entangle more truth- much of it difficult. Greenburg's I have never been good at handling unwarranted attention. 2015 depicts an unpleasant experience all women have endured. (Greenburg replaces an existing figure in vintage negatives.) Greensburg seems disgusted but not surprised as she recoils from what we assume is a senior colleague at a work party. The situation is only made worse by the elder woman who's face we can not see through her supposed husband, but that is just one viewer's read of an image from a residually idealized era in American history. Learn more about Tatiana Parcero and Jennifer Greenburg on their artists pages.